Danfoss’ D1 Axial Piston Pumps are offered with four displacement options in 130-260 cc and pressure, load sense, power limiting and displacement controls. Suitable for use in mining, heavy duty construction, forestry, material handling and marine applications, units provide an output pressure of up to 5075 psi (continuously) and 5800 psi (intermittently). D1 pumps are equipped with integral charge pump that allows speeds of up to 2500 rpm. 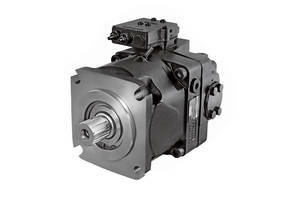 Danfoss Power Solutions introduced the D1 High Power Open Circuit Axial Piston Pump to the North American market. The D1 pump is a high pressure, high flow variable displacement axial piston pump, developed specifically for open circuit systems in the most extreme application environments. Its robust design makes it an ideal solution for mining, heavy duty construction, forestry, material handling and marine, oil and gas markets. The addition of the D1 pump expands the Danfoss open circuit portfolio to include higher hydraulic power options — up to 160gpm [600lpm] — for OEM customers. Working seamlessly with the new PVG 128/256 high flow valves, OEMs have the ability to extend hydraulic support for all their high flow system needs. The pump’s advanced open circuit control options make it ideal for drill rigs, artificial lift systems, harvesters, mulchers, wheel loaders, dumpers, pipe-handling systems and more. While the D1 pump was developed and designed with global expertise, customers will also benefit from the strong local service provided by Danfoss. Danfoss offers technical support through its wide network of local distributors in every state in the U.S. and in more than 100 countries. This level of support translates to shorter lead times and faster delivery for OEMs, allowing them to get to market faster. Danfoss engineers technologies that enable the world of tomorrow to do more with less. We meet the growing need for infrastructure, food supply, energy efficiency and climate-friendly solutions. Our products and services are used in areas such as refrigeration, air conditioning, heating, motor control and mobile machinery. We are also active in the field of renewable energy as well as district heating infrastructure for cities and urban communities. Our innovative engineering dates back to 1933, and today Danfoss is a world leader, employing 24,000 employees and serving customers in more than 100 countries. We are still privately held by the founding family. Read more about us at www.danfoss.com.